Top 5 Tips from SPEAR's "Running For Life: How to Keep Doing What You Love, Injury Free!" It is running season in NYC! 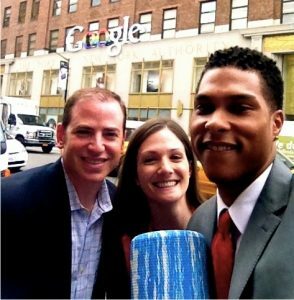 Last month, 16th Street‘s Laura Muzzatti PT, DPT and Kellen Scantlebury PT, DPT, CSCS debuted their fun and informative running talk: “Running For Life: How to Keep Doing What You Love, Injury Free!” at Google’s GFIT gym! Whether you’re a running beginner or an avid runner training for a marathon, Laura and Kellen’s tips will help keep you running safely, happily, and injury-free! 1. Land in the middle. 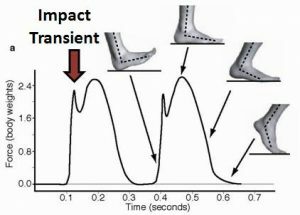 As you can see the impact transient (or force/braking action) on the heel is absent when you’re landing in the middle or the front of your foot. Running with a mid-foot strike will help you prevent injuries over time! To promote landing on your mid-foot, take shorter strides. 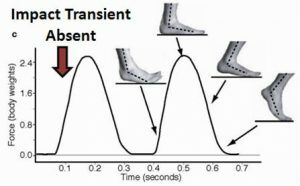 We all want to run with long, graceful strides, however taking longer strides than are appropriate for your body’s dimensions (or over-striding) will promote a heel-strike and will result in injuries over time. Experiment and find the a comfortable stride for you that helps you naturally land on your mid-foot. Once you do, you’ll likely experience less pain in your shins and knees simply by making this small change. 3. Pay attention to your cadence. 4. When it comes to training, gradually increase intensity. Increase the number of your shorter runs before you begin increasing the mileage of each run. This will help to condition your body and help you get fit to run! If you’re training for a race and want to train up your mileage, increase your total weekly mileage by 10-15% per week to prevent overload. 5. Strengthen your core to prevent injury and increase performance. Kellen recommends adding strength training two times a week to your running routine. His strength exercises of choice for runners are: Plank, side planks, dead lifts, clams, squats, and band walks! For pictures and instructions on how to perform these exercises check out the “Running For Life” presentation on slideshare, and of course, consult your friendly neighborhood SPEAR Physical Therapist!